Happy Monday everyone! Hope you guys had a "wonderful" weekend with G20 protesters. I could probably go on and on about the black bloc protesters. but meh, it has been enough said by tons of Torontonians. But let me say "Don't effin destroy my city!" Anyhow, let's put the anger aside and talk about the business. Yes, coz business is fun! I have a super exciting news to share today. 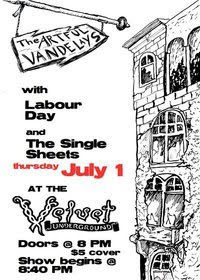 My friend, Anton's band is playing at Velvet Underground on July 1st. You know, usually, when friends are playing at the show, most likely you go to a show coz to support friends from the band, right whether or not you like the band? let's to be honest here. you know what i am saying right? However, this band is different. I mean, different! I have a very good feeling about this band!! 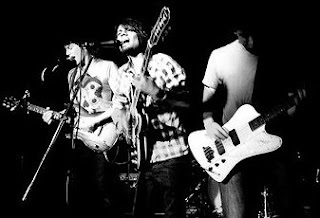 I am seriously looking forward to see how they are at gigs and listen to more new songs from the new up-coming EP!! I probably have been checking out their my space page more than anyone coz i just love the new songs that the band has posted! yes, that's me increasing the hit on the site lol. I didn't know that he was in the band till, what,,, ummm, fairly recently.. I checked out the My Space page and seriously, I was shocked and amused by the fact that the band can create such songs that stuck in my ears for a long time. I have actually dig in their music. My favorite songs from the my space is "Dirty Blood" I just love the guitar into. i also love the guitar riff from the "Silent revolutions." And yeah, you can see me there for sure coz I would LOVE to write the live review from this gig for sure. so come and say hi to me and let me know what you think about my blog or just catch up with me if you haven't seen me. or tell me in my face how much you hate my blog, too, lol Deal!?!?!?!? Here is the My Space site and found a video of "Dirty Blood" (All copy rights go to Artful Vandelays and Anton) See you at the show buddies!! !